Samperio made his debut in the rankings the last time around at number 9, and a relatively quiet couple of months have seen him drop a place. After putting in some dazzling performances in February, Samperio has gone a bit dull in the last couple of months. He’s scored just 1 goal, and his overall consistency has also taken a hit. But all is not lost for the Mainz winger. A strong finish to the season can see him keep his place in the top 10. A player who deals in the spectacular, Calhanoglu has been a regular feature on all the Talent Radar lists since their inception. He continues to impress in the Bundesliga, as Roger Schmidt and his team continue to defy the critics to perform well. Unfortunately for him, despite some positive efforts for his side, he’s missed a few games of late, and been dropped as well. He’s got a lot of time to go though, and can still rise up the charts. Having begun the season on fire, it is disappointing to see Barkley down in 8th place as we approach the end of the season. His season seems to have epitomized that of his team’s- one that had much promise, but has failed to deliver. The last couple of months have been disappointing for him, with his performances dropping as Everton have slid slowly down the table, and crashed out of the cup as well. It will be interesting to see if Hodgson does include the Merseysider in his plans for the Euros. Sane is rated very highly among the many youngsters who are currently breaking through in Germany. The Schalke boy has won plaudits for his style of play which is very aggressive and attacking. The rumours linking him to Liverpool have subsided for a while, and that may have something to do with his slightly flaky performances. While he has done well, especially of late, his earlier performances were too shaky, and as a consequence, he’s taken a sharp drop. The current toast of European football, Ousmane Dembele has jumped 5 places in the rankings following some phenomenal performances. The 18-year-old has carved out a place for himself in our ToTW with his exciting performances, and earned himself the attention of the biggest clubs. While the last couple of games have not seen as much of a ground breaking impact from him, the month of March belonged to Dembele, as he contributed 6 goals to his team’s cause. Dembele now needs to keep up the consistency in order to stay still, let alone move up! The Bundesliga has seen a massive number of young midfielders emerge in the recent past and Mahmoud Dahoud is yet another in this burgeoning list. It came as a surprise to see Gladbach struggling early in the season but they’ve recovered in the post-Favre era and a certain Mahmoud Dahoud has emerged as a mainstay in midfield. With 30 Bundesliga appearances under his belt, the central midfielder is making a name for himself in Germany and beyond. 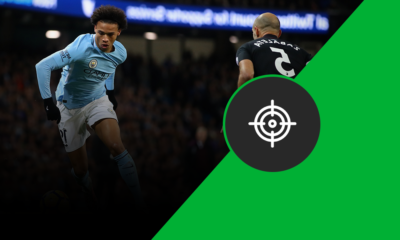 It would take a brave man to bet on Eric Dier being one of the best midfielders in the Premier League at the start of the season but their seemingly outlandish prediction would have been vindicated. The Englishman has been outstanding at the heart of the Spurs midfield and has played a crucial role in Spurs having the tightest defence in the league. Comfortable on the ball with excellent reading of the game, Dier has seen his stock rise remarkably over the past year. The winds of change are preparing to blow through the Allianz Arena and it’s not limited to the touchline alone. Gone are the days when Robben and Ribery were ever constants down the wings as injury has seen their roles diminish in recent times. However, the sizable gap left in the team has been filled admirably by Douglas Costa and more pertinently to this discussion, Kingsley Coman. The Frenchman has been thoroughly exciting to watch and with 6 goals and 11 assists at the time of writing this campaign, he looks to have a bright future in Bavaria. “He’s better than Ozil” chant the Spurs fans. While this sentiment has to be taken with a pinch of salt given the hyperbolic nature of football chants, there’s certainly a lot to be excited about when it comes to this young English star. The 20-year-old has been on fire in his first season of top flight football and has caught many an eye due to the consummate ease with which he dispatches opposition defences. Having snared up the PFA Young Player of the Year award, Alli is looking at a ban following his punch to West Brom’s Claudio Yacob’s gut. A potential suspension could see him slip down the rankings but one would hope that it would help cut out the petulant side of Dele Alli’s game. 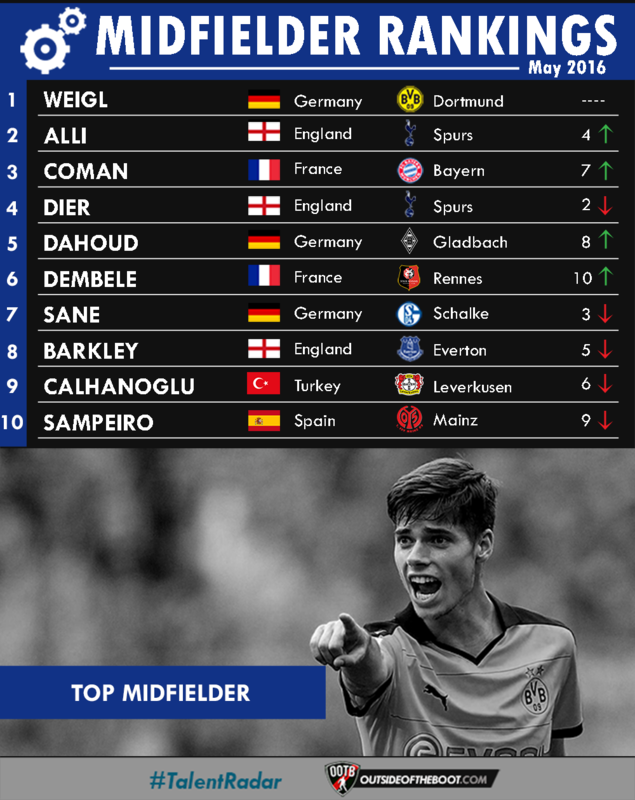 Few would have guessed that Julian Weigl would play such an important role in Dortmund after he was signed at the start of the season but the youngster has done just that. The defensive midfielder is no longer a role that goes under the radar and the likes of Sergio Busquets have almost made the position one of the most analyzed ones in modern football. Those with such an affinity towards the position will certainly like what they see when it comes to Julian Weigl. Assured in possession and integral as a screen in front of the back 4, Weigl has done little wrong in his 48 club appearances this season.